This entry was posted on 9th June 2014 by Tom Richardson. 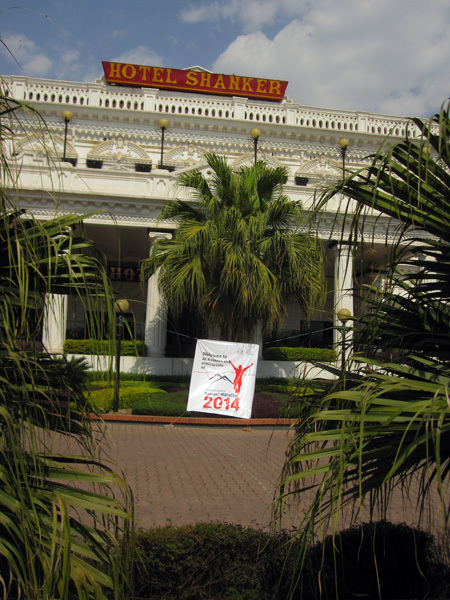 Last year, just for fun, I signed up for the World’s Highest Marathon, the Tenzing Hillary Everest Marathon (THEM). It was my second ever race, the first being the Lincoln Half marathon in 1984! THEM begins at Everest Base Camp on the Khumbu Glacier at 5300m and descends to the village of Namche Bazaar at 3400m over the full Marathon distance, although it does involve considerable ascent along the way. 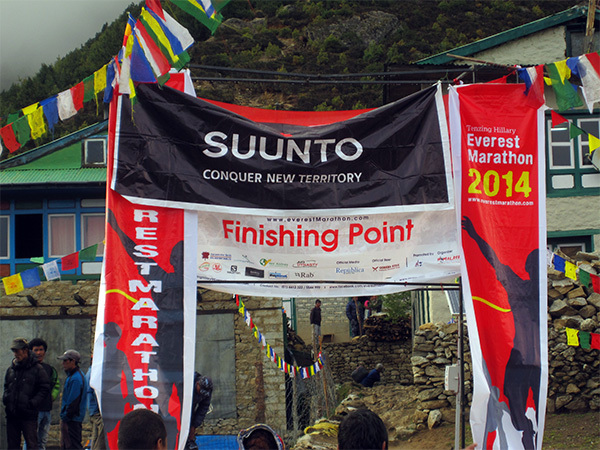 There is also a 60km (to commemorate the 60th Anniversary of the first ascent of Everest) and a half marathon at the same time. Running with my friend Phanden Sherpa in 2013 we had a great day in good conditions. Crossing the finishing line in the middle of the rankings in 8hrs 41mins. But you know how it is - these things niggle away at you. You begin to wonder if some running and high altitude trekking beforehand may have shaved a minute or two from the time. In January of this year I was helping my friends at Himalayan Expeditions, the Kathmandu based organisers of this 11 year old event. They were exhibiting at the Adventure Travel Show in Olympia London. They said that if I could help with the 2014 event and be a sort of “Goodwill Ambassador” they’d sign me up again to give it another go. OK.
On the 18th of May 2014, after a 40 minute flight from Kathmandu, I began the 11 day trek from the tiny airstrip at Lukla at 2800m to Everest Base Camp at 5300m. I was looking after a group of 19 runners from Germany, Austria, the Netherlands and the USA. Usually in the late spring the trails are packed with descending yaks, local expedition crews and foreign climbers as the annual climbing of Everest season comes to end. Sadly this year the trails were empty. All expeditions had abandoned their attempts following the avalanche tragedy that killed 16 Sherpas in the Khumbu Icefall early in the season. There were a total of 131 marathon runners, 18 for the Ultra, 6 for the half marathon and a number of supporting trekkers. They were divided into groups either camping or staying in lodges and spread across several days to avoid congestion. 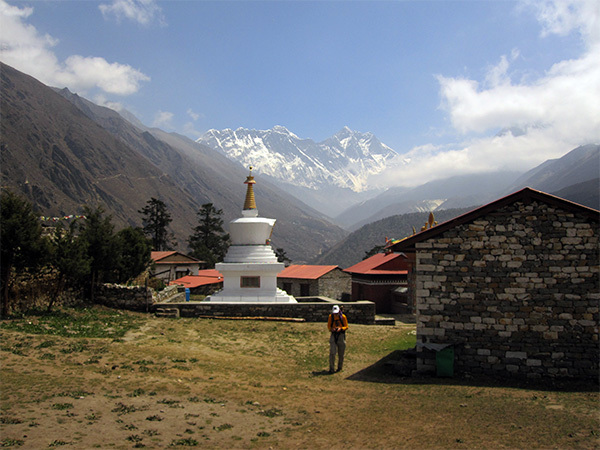 The weather was fairly good until day eight at the settlement of Lobuche at about 4900m. 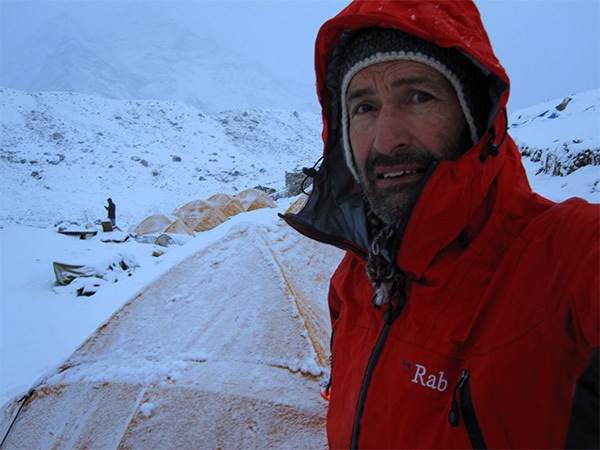 I woke in the night in my tent to the silence that I had learnt over many expeditions meant bad news. I got dressed and started digging out all the other tents from under a thick suffocating blanket of snow. Not only will the weight of snow collapse the tents, but before that it will seal off all the ventilation. Over the next two days we trekked via Gorak Shep, making the traditional ascent (without a view) of Kalar Pattar and onwards to the Base Camp in continuous snowfall. 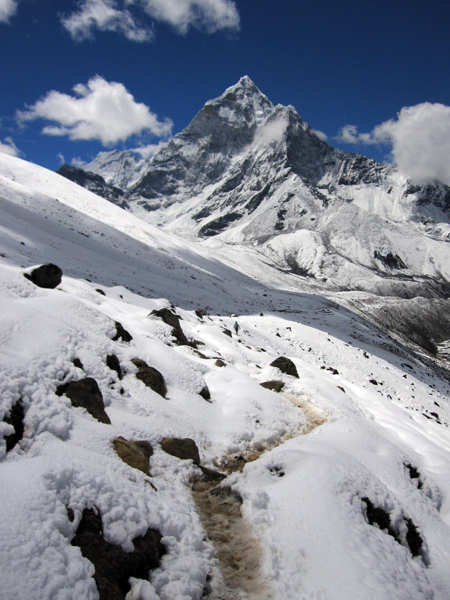 The final descent from the moraines to the ice of the Khumbu glacier takes a diagonal trail under hanging loose rocks. It’s always a stone fall risk but with the snow it became an avalanche risk too. This year Phanden was not running but was responsible for building the Base Camp; a tent city of dozens of yellow dome tents, dining tents, kitchens and toilets all perched on the jagged surface of the Khumbu Glacier. The snow continued to fall as the full race population arrived. One unusual task at the base camp was to arrange, if not quite a wedding, a blessing for 2 Germans in the group. On request I had carried the traditional Sherpa/Sherpani clothing up with me and arranged for a lama (monk) to give a blessing. Amrit, our cook, had even baked a cake. The only person who was none the wiser to the preparations was the potential bride. Fortunately Carola seemed delighted at the idea of marrying Frank! Again I woke in the night. It was quite obvious that not only was running on deep snow and fractured invisible ice dangerous, the more the snow fell, the greater was the risk of avalanche and rock fall. There was not even a safe period when it froze in the night. There was no choice - we had to evacuate the Base Camp asap. 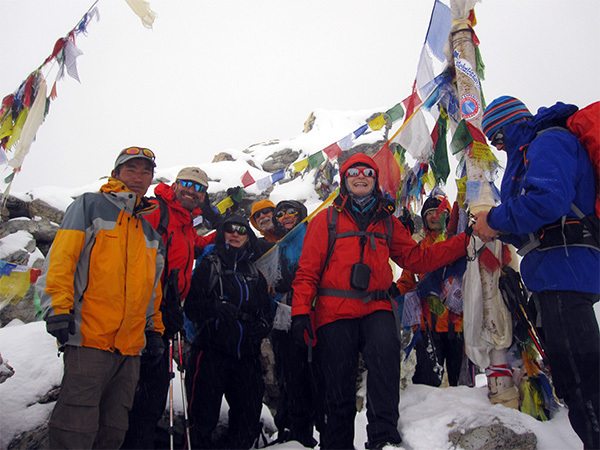 As soon as we could the whole group prepared to depart back to the lodges at Gorak Shep. What had been a reasonable walk the day before was now deep with snow. My friend Kunga Sherpa and I broke trail in frequently waist deep snow back to safety, trailing 100+ people behind. 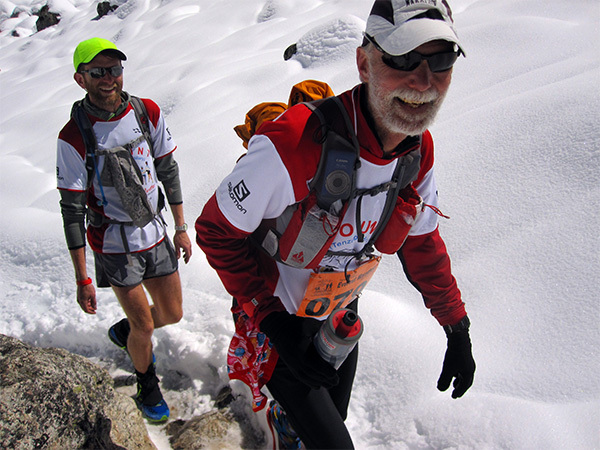 Many runners of course had never experienced such mountain conditions. They were either blind to the dangers and would take a breather directly in the line of potentially tumbling rocks. Or were on the edge of panic anticipating being engulfed at any moment. Despite all of this we all eventually arrived safely back at Gorak Shep. Meanwhile, Pasang, our in-the-field organiser and one of the few Nepalese UIAGM guides. Coordinated with all the Himalayan Expedition staff across the race route and back in Kathmandu, rearranging the Marathon and Ultra, starting at Gorak Shep, the following day. The race traditionally takes place on the same day, the 29th of May, the date of the first ascent of Everest and 2014 was no exception. The weather on the 29th was beautiful with blue skies forming the backdrop to snow covered mountains on all sides. The snow meant, however, that as soon as you stepped off the narrow trail you sank knee deep in it. This combined with the fact that the first hour involves crossing a moraine and boulder covered glacier meant that there was little chance to overtake others. The first long steep descent zig zags over a small plain where the memorials for those lost on Everest command a panoramic view across the peaks of Tamserku and Kangtega, miles away and towering above our final destination Namche Bazaar. The snowline was at about 4300m at the village of Dingboche. Unfortunately this was the point where the route takes an uphill turn back into the snow. Heading towards the impressive south face of Lhotse to complete a loop to create the correct distance. Few people can run on the uphill section especially at its high point of nearly 4700m. On completion of the loop back at Dingboche there was one of the many food and drink points and an electronic wrist tag recorder, but best of all friends and other trekkers to cheer us on. It marked the half way point. Following this a long descent takes you to the village of Pangboche and beyond that a dramatic river crossing. For about a decade a rigid metal bridge gave a solid and safe crossing. Unfortunately, during the 2013 monsoon (and without any people or animals on it) it collapsed into the river. The new temporary wooden bridge further upstream requires a crossing under very unstable cliffs. As I approached a huge slough of rocks tumbled down some 20 metres ahead of me. As soon as it stopped I sprinted for safety. In 2013 the hardest section for both Phanden and I was the ascent of the hill up to the famous monastery at Thengboche. This year it was made worse as it began to rain. Nonetheless I began to realise as I checked the time, I was going well. I might do a bit better than just shaving off a few minutes. Running now with an Australian, I scuttled down the forest clad hill on the other side of Thengboche to the lowest point on the route at Phuki Tenga, a bridge over the Dudh Kosi river at 3250m. Ahead I could see two of the runners from my group. They were just beginning the climb up the hill on the other side. The trail into Namche is snake like, winding in and out and up and down across the hill side. I pushed on. At the final corner there is a large stupa where some supporters had gathered. "Come on, you can do it" one of them encouraged. I wasn’t sure, but it nearly made me burst into tears anyway. Then the finish appeared. The banners, the tents, the people were all buzzing about. I couldn’t see my watch without glasses but didn’t dare to even slow down to look. It didn’t matter that there were many runners ahead of me, already wearing their medals and track suits exchanging stories with each other. Neither did it matter that there were a similar number probably behind and in some cases many hours behind. I pushed on. As I crossed the finishing line there was a wall of cameras clicking and friends giving hugs of congratulations. I could hardly speak .Still holding back the tears, I donned my tracksuit and collected my medal and certificate. The judge said 8 hours and 5 minutes Mr Thomas Sir. That would do me just fine I replied. I was 36 minutes faster and was 57th out of 131 runners. In first place was Mr Sudip Kulung from Nepal in a time of 3hrs 52 09. The last to arrive that day was Ms Hee Ja Moon from South Korea in 14hrs and 5 minutes. Already I can’t decide. Next year when I’m 60, I could have a go at the 60km. However I’m sure I could get to below the 8 hour mark on the marathon……?